Basil essential oil is made from the Ocimum basilicum plant, which is part of the mint family. Basil is also called great basil and Saint Joseph’s wort, while basil essential oil is sometimes called sweet basil oil. Although basil essential oil is used to enhance many recipes, there are also many health benefits of basil essential oil. Today, basil is commonly used in cooking to add flavor to pasta, meats, and other entrée dishes. Basil essential oil in general has a naturally warm, sweet, spicy, and herbal smell. However, the uses of basil and basil oil go far beyond the kitchen. Basil is a natural anti-inflammatory, antibiotic, antiviral, and diuretic. It has been used in traditional Asian Indian medicine for centuries. In the 16th century, basil leaves were used to treat chest infections and migraines. While fresh basil is beneficial and flavorful, basil essential oil is considerably more potent and concentrated. The beneficial compounds from basil oil are steam-distilled from fresh basil flowers, stems, and leaves. The end-product is an extract that contains high amounts of antioxidants and phytochemicals. Its chemical compounds primarily consist of phenylpropanoids and monterpenes. The most prominent, active constituents in basil essential oil include methyl chavicol and methyl eugenol. According to a review published in the Ancient Science of Life journal in 2014, basil essential oil has been used effectively for treating coughs, headaches, warts, constipation, diarrhea, kidney malfunctions, worms, and more. Basil oil is found in dental and oral products, beverages, and foods due to its antibacterial properties. The following are 10 health benefits and uses of basil essential oil explained in further detail. A report published in The Journal of Food Protection in 2001, found that basil oil was effective at controlling growth and survival of multiple dangerous microorganisms within contaminated foods. Research has also shown its antimicrobial activity against a wide range of food-borne bacteria, mold, and yeasts. Studies have shown that basil oil would positively inhibit three strains of fungi, and six forms of bacteria. Basil oil also detoxifies the body of viruses and bacteria. It also fights fatigue, pain, and inflammation. This means basil essential oil is great when you have a cold or flu. Basil oil combines well with eucalyptus oil for a homemade vapor rub that can be massaged into the chest to open the nasal passages. You can also diffuse it throughout your home, or add a couple of drops for a steam bath. Basil essential oil is capable of becoming a natural air fresher that can eliminate mold and odor-causing bacteria from the home, furniture, appliances, and car. Simply combine with baking soda to remove stains and bacteria from pans and pots. You can also spray basil oil inside your garbage cans, shower, and toilet, or run several drops through your kitchen appliances to improve the smell. Basil oil is naturally uplifting and energizing. As a result, it can fight chronic fatigue, sluggishness, and adrenal fatigue. It restores mental alertness, poor mood, and brain fog, as well as reduces nervousness or anxiety symptoms. For an instant pick-me-up, simply dab several drops to your back, chest, or wrists. You can also burn basil oil at home to help you unwind and relax. Ayurvedic medicine has used basil oil for centuries as a natural ear infection remedy. How do you speed up the time it takes to recover from ear infections? Simply rub the combination of basil essential oil, coconut oil, and frankincense essential oil at the bottoms of the feet and behind the ears. This method will help decrease swelling and pain. For fatigued or aching muscles, rub a few drops of basil essential oil and coconut oil into your swollen or painful joints or muscles. For further immediate relief, soak in a warm bath with basil oil, lavender oil, and Epsom salts. The volatile oils in basil essential oil can help prevent bug bites and repel mosquitoes. 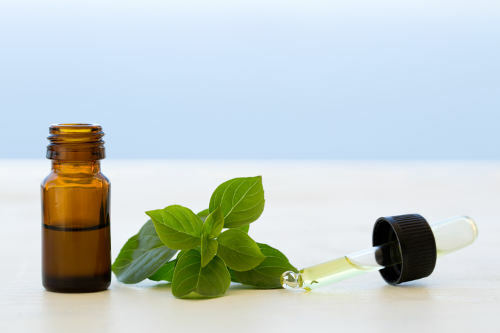 For a homemade bug lotion or spray, dilute several basil essential oils drops with carrier oil, and massage the mixture into your bite or swollen skin. Basil oil is also an effective home remedy for urinary tract infections and bladder problems. This is because basil essential oil has antiviral, antibacterial, and disinfectant properties that can help speed up the healing process for painful infections, as well as detoxify the digestive and urinary tracts. The diuretic ability of basil essential oil helps increase urine production. As a result, this can be useful for digestive issues like uncomfortable bloating. The antispasmodic properties of basil oil are also helpful for reducing cramps linked with food sensitivities or other digestive issues. Others also find basil oil effective for motion sickness, nausea, and constipation. To boost digestion, add one to two drops of basil oil to herbal tea or warm water. You can also massage it directly to painful areas like the abdomen, or inhale it. Adding two drops of basil essential oil to your shampoo can help you avoid grease buildup on your hair. Also, prevent hair grease with the combination of basil oil, baking soda, and apple cider vinegar. Basil oil also acts like an acne home remedy. For this, simply apply a drop or two of basil oil and coconut oil using a clean cotton ball to your acne once or twice daily. There are a number of effective ways to use basil essential oil at home right now. The FDA (U.S. Food and Drug Administration) recognizes pure basil essential oil for safe consumption; however, this is only when using 100% high-quality, therapeutic-grade oil brands. You should purchase your oil from a reputable seller. Look for an essential oil made from Ocimum basilicum. You can add it to a few drops of water, or it can be added to a smoothie or honey for dietary supplement purposes. Using an oil diffuser or vaporizer, basil essential oil can be diffused throughout your home. You can also inhale the oil directly from the bottle. Rubbing several drops into your palms, and placing your hands over your face to inhale, is also an effective way to get the aromatherapy benefits of basil essential oil. Before applying basil essential to your skin, the oil should be diluted with carrier oil like coconut oil, avocado oil, jojoba oil, or sweet almond oil. Basil oil is very potent, so start very slowly, and use several drops at a time. Sometimes basil oil can cause skin reactions in those with sensitive skin, so it is best to avoid using on your neck, face, or chest before making sure you react positively to the oil. Doing laundry is not only expensive, but it also contains toxic chemicals. Instead of buying laundry soap, try making your own with the following laundry soap recipe that also contains basil essential oil. As a result, the basil essential oil recipe is cost-effective, antibacterial, and deodorizing. It also only takes five minutes to make, and is good for 12 to 15 loads of laundry. Basil essential oil is loaded with health benefits, and also has many fantastic uses. That being said, basil essential oil should be avoided during pregnancy, because it can have an impact on muscle or nerve functioning and hormonal levels. It is also not the best essential oil for those with epilepsy. Similar to all essential oils, test basil essential oil for skin sensitivity prior to using it on your skin. It is a good idea to perform a skin patch test on your forearm or feet to make sure you don’t experience allergic reactions, burning, redness, or hives. Also, keep basil essential oil away from your eyes, as well as the inside of your nose or ears. “Health Benefits of Basil Essential Oil,” Organic Facts; https://www.organicfacts.net/health-benefits/basil-essential-oil.html, last accessed February 13, 2017. “Basil Ocinum basilicum,” doTERRA; https://doterra.com/US/en/p/basil-oil, last accessed February 13, 2017. “Basil Essential Oil,” AromaWeb; http://www.aromaweb.com/essential-oils/basil-oil.asp, last accessed February 13, 2017. “Basil Essential Oil: Uses, Benefits, and Precautions,” Sustainable Baby Steps; http://www.sustainablebabysteps.com/basil-essential-oils.html, last accessed February 13, 2017. “Basil Essential Oil Fights Bacteria, Colds & Bad Odor,” Dr. Axe; https://draxe.com/basil-essential-oil/, last accessed February 13, 2017.